The tricky part is finding the right location for the thermocouple inside the soldering iron. The thermocouple is very sensitive and temperature readings can be affected by the slightest change in position. The idea is to make sure that the temperature input of the controller is accurate. One way to do this is to plug the thermocouple directly into a K-type thermometer and plug the soldering iron into an AC outlet. 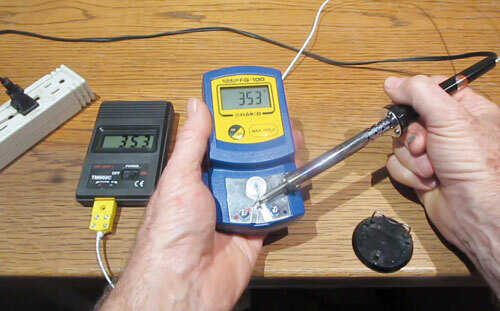 The thermometer will display the temperature inside the soldering iron that the thermocouple is reading. This is the temperature that will be input into the controller. Now check the tip temperature with a tip thermometer. If the temperature of the tip is more than the internal temperature, then adjust the thermocouple by very gently pushing on it inward towards the heating element inside soldering iron. If the temperature of the tip is less than the internal temperature, then adjust the thermocouple by very gently pulling it outward away from the heating element inside the soldering iron. You shouldn’t feel any actual movement of the thermocouple cable. It shouldn’t slip or anything like that. It must be firmly secured to the power cord with zip ties and the power cord should not move in or out of the soldering iron if it has a strain relief knot properly tied in the right spot. You should only sense a slight tension on the cable either going into or away from the soldering iron. Watch the thermometer as you make the adjustment and back off as soon as you see the temperature match the tip temperature reading that you took. The slightest amount of tension can change the thermocouple reading by several degrees. With a little bit of luck you may be able to get it just right.